Each medium of the 17 materials analyzed in The Spirit of Matter begins with keywords. 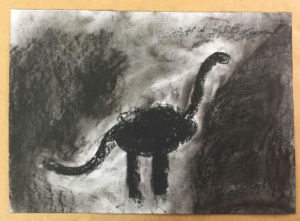 Fourth graders were suggested by their art teacher, to use charcoal to draw very quickly a few toys. 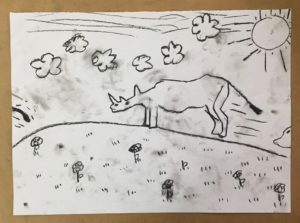 It was a preparation lesson for drawing animals outside. 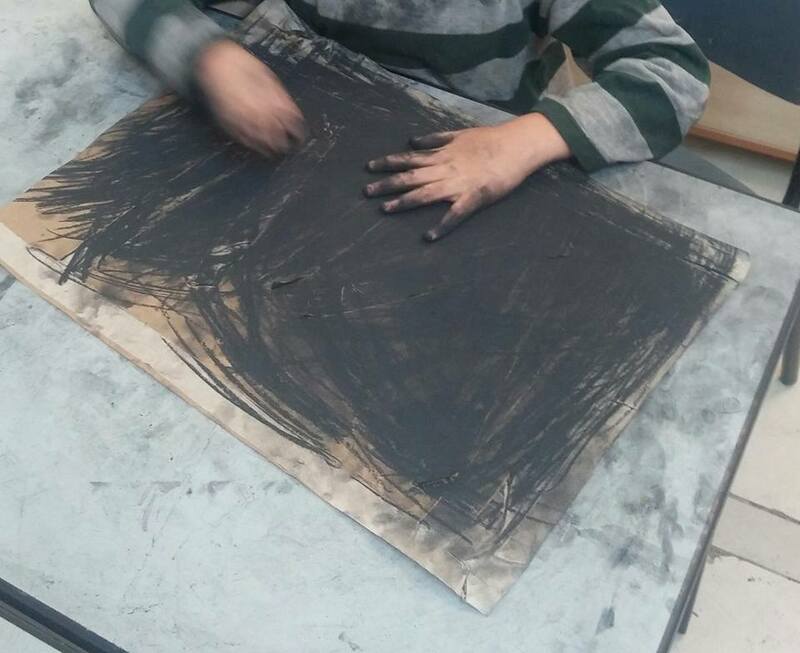 She showed them how to work quickly with the width of the charcoal and not only the point. 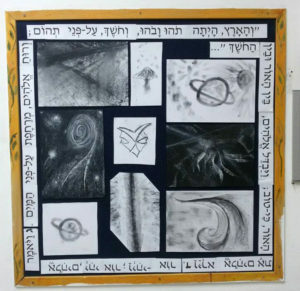 Another art teacher, Shira Levine Weiss, works in a psychiatric ward, with adolescents. The studio time is unique as it is associated to conventional life, because she is not a therapist. This has a good impact on the group. 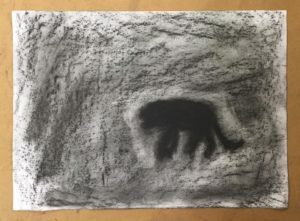 She introduced a text from Genesis and the medium she chose for a personal process relating to both, was charcoal and white paper. As she always does, the images are being hung with the text next to it. Both teachers used the material as a catalyst for the interventions needed. If you read the following text – you can see this clearly. Each touch of charcoal on white paper, starting with the first mark, conveys a dramatic sensation. Its color ranges from light grays to an intense, velvety, deep black. Charcoal has a tremendous range. It has an expressive presence and can be harsh and sharp, especially on white paper. It produces a lot of black dust and stains everything it comes in contact with. Thus, we can see that it is suitable for working on extreme emotions, anger, shame, guilt, longing and pain. On the other hand, it can also be sensual, “elegant” and “cultural”, especially vine charcoal. It produces rich monochromatic shades of black. An artwork built gradually into the paper using layered nets fixed with fixative, becomes deeper both emotionally and technically. 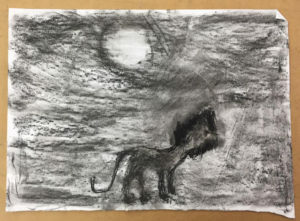 It is a clear metaphor for the process the client is going through, as charcoal easily relates to underlying emotional states. Orbach Nona & Galkin Lilach. The Spirit of Matter – A Database Handbook for Therapists, Artists and Educators (Kindle Locations 198-209). Orbach Nona.